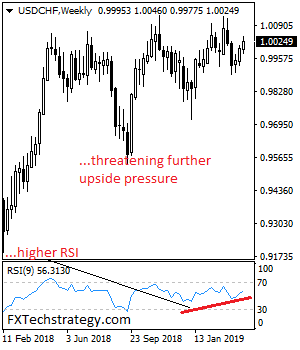 USD/CHF continues to eye further upside pressure following it higher close the past week. Resistance stands at the 1.0050 level. A break of there will clear the way for a run at the 1.0100 level. Above here, resistance lies at the 1.0050 level and then the 1.0150 level. Its weekly RSI is pointing higher suggesting more strength. On the downside, support is seen at the 0.9950 level. A turn below here will set the stage for more decline towards the 0.9900 level. And then the 0.9850 level. Further down, support resides at the 0.9800 level. All in all, USDCHF continues to eye further upside pressure on corrective recovery.